Go serverless. Build apps faster and stop worrying about infrastructure. Serverless computing represents the next evolution in cloud—making it easier to innovate at high velocity, for less. By focusing on your code instead of infrastructure, you’ll build apps faster and only pay for the time your code runs—while Azure scales for you. - What Azure serverless services mean for your business. - How easy it is to create end-to-end serverless applications. - How to enrich your existing apps and solutions by incorporating serverless functionalty. - Whether your preferred coding language is .NET, Java, Node.js, Python, PHP, or something else, Azure serverless allows you to run your apps in the cloud without having to worry about infrastructure. When you're managing a project, it's important to know who's doing what, when they're doing it, and how long it's expected to take so you can finish on time and stay within your budget. Project Online enables organizations to proactively manage resource utilization, identify bottlenecks early, accurately forecast resource needs, and improve project selection and timely delivery. Discover tools that can help you ensure your projects are properly staffed. Find out how you can identify overused and underused resources to optimize assignments. Learn how you can post updates from any device and oversee progress while you're on the go. Unlocking critical insights from increasingly complex data requires cloud-compatible, intelligent, more secure applications. Your apps need to be dependably accessible, regardless of platform, user location, or device. SQL Server 2017 is engineered precisely to support these needs with modern database management. It helps you uncover valuable insights hidden in your data and use that information to transform your business. Find out how you can turn raw data into meaningful reports that can be delivered to any device. Learn how SQL Server 2017 empowers businesses with data warehousing, whether on-premises, in the cloud, or both. Discover the security capabilities of the Azure cloud. Employee productivity is a priority for most business leaders. Workplace Analytics provides information that helps leaders make better business decisions. It leverages Office 365 collaboration data to deliver powerful new insights for enterprise productivity, allowing business leaders to understand the collaboration patterns across organizations that influence productivity and employee engagement. Learn how you can unlock new insights into your workforce. Discover how Workplace Analytics can help you make decisions that lead to higher employee engagement. See how you can define privacy controls to meet your needs while staying compliant to protect your data. Content is an important organizational asset that embodies the knowledge and processes of individual businesses. As the transition from traditional enterprise content management to dynamic content services has taken place, the ways in which organizations create, manage, and share content have also evolved. More than 300,000 organizations now use SharePoint and OneDrive in Microsoft 365, including 85 percent of Fortune 500 companies. Active users grew over 90 percent, and data stored and sync usage grew over 300 percent in the last year alone. Find out how you can help protect your content in SharePoint and OneDrive with security controls. Learn how to use SharePoint's simple, quick interface to manage multiple file types. See how you can use PowerApps and Flow to transform your business processes. Microsoft Azure Security Center makes it easier than ever to protect your Azure virtual machines and virtual networks, enabling you to move to the cloud with confidence. In addition to helping you protect your Azure resources, Security Center also protects servers and VMs running on-premises and in other cloud platforms like AWS and GCP. Azure has uniquely built-in security management that helps improve your productivity with native intelligence systems, like machine learning based recommendations and threat information sourced from the Microsoft Intelligent Security Graph. Join us for this Microsoft AI webinar to learn how new Azure Bot Service and Language Understanding Intelligent Service features enable developers to build bots and language models that allow any application to understand language commands and act accordingly. In today’s connected world, devices and data can be found far outside traditional data centers or offices, in places like oil wells, hospitals or factory floors. For these businesses, connectivity can be expensive and unreliable and get in the way of implementing effective IoT solutions. Azure IoT Edge is a service that allows cloud intelligence to run on your IoT devices locally. With Azure IoT Edge, you can deploy cloud workloads such as Artificial Intelligence, Azure Machine Learning, Azure Stream Analytics, Azure Functions or custom code via containers directly on your IoT device to enable real-time insights. Join us for a webinar on how to approach the modernization of your existing.NET Framework web or service-oriented applications. App modernization, commonly referred to as “lift and shift”, is the action of moving a workload to a newer or more modern environment without altering the application's code and basic architecture. We’ll examine how to move your existing .NET Framework server-applications directly to Azure by modernizing specific areas, without re-architecting or recoding entire applications. We’ll also highlight the benefits of moving your apps to the cloud and partially modernizing apps by using a specific set of new technologies and approaches, like Windows Containers and orchestrators in Azure. The way people work together is changing. Users struggle to manage multiple logins as well as share and discover information, while IT experts face the threat of shadow applications creeping in and threatening security and compliance. The combination of unique workstyles, colleagues from different generations, and collaborators with differing expectations necessitates a universal toolkit for teamwork. Microsoft Teams is the hub for teamwork in Office 365, integrating with Office 365 apps and consolidating the tools you and your colleagues use to get things done. Find out how Teams facilitates chat, calls, and meetings for modern collaboration. Discover how you can leverage the enterprise security, compliance, and manageability of Office 365 to reach your objectives. See how you can customize and extend your Microsoft Teams experience with updates from the apps you use every day. In this session, learn about Microsoft’s vision and strategy for helping companies transform, Microsoft’s own digital transformation, as well as that of innovative customer Otis Elevator Company. You’ll see impactful demonstrations illustrating innovative use cases in sales, service, and marketing, including insight on our partnership with Adobe and LinkedIn and how we're changing the way companies work. Join Grad Conn, Marketing Visionary and Thought Leader, who will challenge you and your organization to do business differently. This session includes a panel discussion with our latest partners; D&B and Sprinklr. Rishi Dave CMO, Dun & Bradstreet and Paul Herman, VP, Product and Solutions Enablement Group, Sprinklr sit down with Grad to discuss the critical role that the Microsoft partner ecosystem plays in the cross-industry digital transformation journey. You won't want to miss a beat! Running applications in the cloud can feel daunting without the right platform to help you manage and operate them effectively. Container technology has grown in popularity to help address this challenge, including the use of an orchestrator to help deploy, scale, and operate application containers across clusters of hosts to ensure they run as intended. Kubernetes has become the defacto standard to manage containers due to its functionality and most importantly the fact it has a large open source following. According to a recent MIT Sloan Management Review and Deloitte University Press report, Aligning the Organization for Its Digital Focus, nearly 90% of more than 3,700 business executives, managers and analysts from around the globe say they anticipate their industries will be moderately or greatly disrupted by digital trends. Yet less than half (44%) currently believe their organization is adequately preparing for this digital disruption. In this keynote, Vice President and Principal Analyst of Forrester will reveal six key strategies to drive new customer value and revenue, and challenge your thinking to ensure your companies survive as “predator”, not “prey”. As organizations evolve to use more collaboration and communication tools, the promises of artificial intelligence and machine learning are becoming real. Meanwhile, organizations are gaining massive amounts of intelligence through the Microsoft Graph. What if businesses could harness the intelligence of cognitive services, machine learning, and the Microsoft Graph to give teams a better way to collaborate and communicate, thereby changing the very nature of calling and meeting experiences? This vision of intelligent, informed communication and collaboration is now possible. Discover how Microsoft is delivering on the vision of intelligent communications. Learn what changes your organization already has the ability to make. Find out how to assess what intelligent communications mean for your unique business and needs. Why does security feel like the most frustrating challenge in government IT? In part because security in a cloud-first, mobile-first world calls for new approaches. Data is accessed, used, and shared on-premises and in the cloud, erasing traditional security boundaries. During this webinar, we'll take a look at cybersecurity trends and introduce some resulting strategy shifts that can help government organizations detect and respond to attacks while making faster, more coordinated overall cybersecurity decisions. Microsoft Cognitive Services helps day-to-day developers create powerful applications with the capability to think and process information like humans. Learn first-hand about Microsoft Cognitive Services and how you can easily build customer-facing AI applications with Vision, Language, Speech, Knowledge and Search functionality. We will also provide an overview of the Cognitive Services API collection (30 APIs), share how customers are using Cognitive Services APIs today and provide demonstrations of how powerful these APIs can be when combined with real world applications. - All the API Keys you can take advantage of, falling under Vision, Speech, Language Knowledge and Search and how to leverage these to innovate your existing technologies. Are you interested in building innovative IoT solutions to help your company improve efficiencies or create new revenue opportunities – but not sure where to start? Whether you’re an app developer, cloud developer or just looking for your next moonlighting project, come learn about the nuts and bolts of Azure IoT development from the experts. - How to get started using Azure IoT Hub, IoT Starter Kits and SDKs. - How to connect your first devices to Azure IoT Hub. - How to manage devices at scale with IoT Hub device management. Designed for engineers, technologists and others in IT who are new to the cloud or new to Azure, this introductory webinar will demonstrate how using a cloud-based infrastructure can help you reduce costs, improve security and innovate rapidly. You’ll learn about common scenarios and use cases for infrastructure services, and get a walk-through of how to start using Azure. Join us to learn why Microsoft Azure is the best cloud platform for your Windows Server workloads. Discover great resources to get started with Azure and view an in-depth demonstration on how to best use Azure— then be ready to add “cloud admin” to your list of superpowers. Deploying and managing infrastructure has historically been a manual and often error-prone process. The popular DevOps concept known as Infrastructure as Code (IaC), using HashiCorp Terraform allows you to avoid these challenges by creating reliable, repeatable and automated deployments on Microsoft Azure. Join us for an on demand webinar with experts from Microsoft and HashiCorp to learn about the benefits of using Terraform with Azure and learn how to create a deployment for a multi-tier application with networking and security requirements. Explore new perspectives on technology from Microsoft subject matter experts and industry thought leaders. Title: Go serverless. 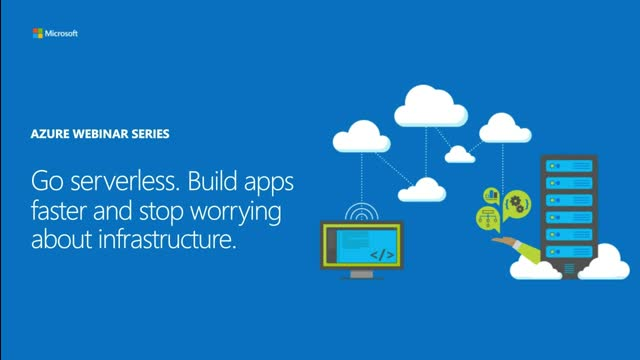 Build apps faster and stop worrying about infrastructure.